Florida Survival Gardening: @The Prepper Project: Is Growing Grains a Good Survival Strategy? In my latest post for The Prepper Project, I cover the pros and cons of cereals and pseudo-cereals, plus suggest a few good small-scale grains. Check it out! I tend to agree with your assessment. I have long wondered about the elevated place grain gets as part of the engine for civilization. To me it seems more the reverse: civilization (aka technology and efficiencies of scale) are what is needed in order to make grain worthwhile. I agree on corn being one of the few exceptions. I'm also happy that corn has a fairly high protein ratio compared to most other grains. Some of the heirloom grain corns have as high as 15-20% protein. Add that to the 10-12% fats and you are getting much less of a carb bomb than the typical white wheat flour with its 5% protein. I recently tried to grow a few grains just for the fun of it. I managed to get about 2 breakfast cereal bowls worth of oats from a bio-intensive 2x8' patch, and a quarter pound of flax seeds from a similar patch. Problem is, it's a lot of work to harvest by hand, and once you harvest, you are done until the next season. Meanwhile, my cucumbers, tomatoes and pumpkins just keep on delivering. And when my yard-long beans start yielding, I will have a steady supply of human and animal fodder for the next 4 months. I did try one of the heirloom grain corns (Floriani Red), but I'm still a newbie with corn. The yield so far has been underwhelming. I planted them at various times starting around late February, and it seems only the first few are doing anything worthwhile. I guess if you miss the seasonal window it just isn't worth it. The good news is that I planted pumpkins, squash and melons around the corn, and they are taking off like wildfire. ok, you've inspired me to take pictures of my sorghum plants for you. I'm pretty sure chickens will like sorghum, because my parrots will kill random humans for it (if murder can be done by evil looks alone). 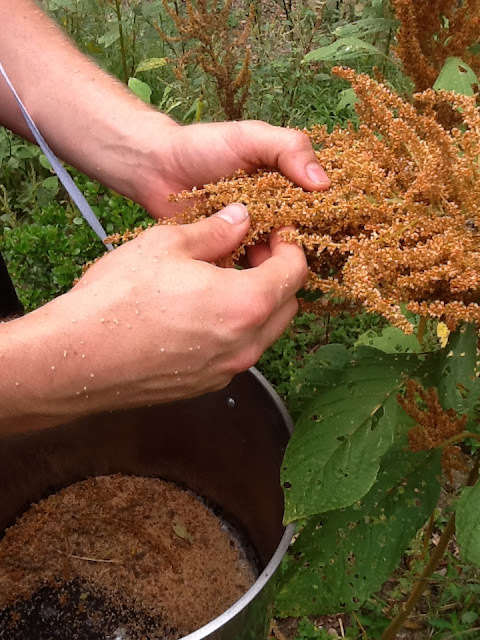 but really, if i was going to try to grow grains for chicken feed i would buy some birdseed and grow it - the mix is usually black oil sunflower, millet, and sorghum. all short varieties. i think people like grains so much because they love bread. you should write a post about harvesting and eating bugs. my dad's pool is always full of june bugs every day. i bet those could be cooked and eaten, maybe after a bit of soaking to get some of the chlorine out. Grains have more going for them than you give them credit for, if you have enough space to grow them. In a typically small garden they definitely don't make sense, corn excepted as you noted. At 30 bushels per acre, you can harvest 180 lb. off of a 0.1 acre plot--and rotate into bush beans in the off season. "if you have enough space to grow them." That's really the key. I'm aiming more at the small-scale gardener in this article. If you have the space and the right tools, grains can be amazing - there's a reason they're major staples world-wide. I recently got a much larger plot of land to work with and I'll be adding some grains to that in rotation, just as you're suggesting. Thanks for stopping by.